Michael's flight home from Hong Kong was delayed by over six hours which was not happy news for the boys who were expecting him to be here this morning. 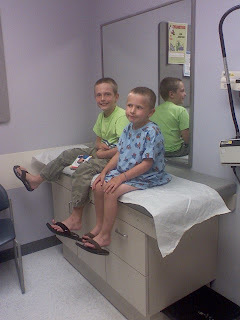 The boys and I got to spend the last Saturday of summer vacation at urgent care, where Benjamin got treated for an infection instead of frolicking at the beach, park, or any other place that doesn't require a hospital gown. The kids were good sports though and we're off in a little bit to pick Daddy up! But where will we go if we can't go for guacamole?